We’ll start with the most important updates of all, Android 4.3 for Galaxy Note 2 and Galaxy S4. Yesterday two test firmwares were released on the internet with Android 4.3 prepared for these 2 flagships. 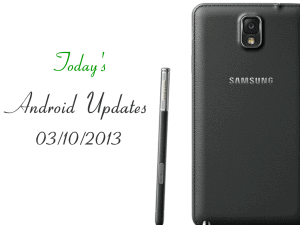 To read more about the update, check out Leaked Android 4.3 for Galaxy Note 2 and Leaked Android 4.3 for Galaxy S4.